Cloud 9 Fiji invites guests to escape to their floating paradise, the one and only floating bar in Fiji. Book your ticket to Cloud 9 online now through our easy booking process. Guests can enjoy a wide selection of international spirits, mouth watering Italian woodfire pizza’s while sitting back to admire the stunning surroundings of crystal clear ocean as far as the eye can see. It's really the best place to spend your day with friends or family, enjoy international Dj sets, fun water activites and the beautiful surroundings. If you have a bigger group of friends, you can request to have a Dj on board. Snorkelling equipment is available for you to take the plunge around Cloud 9 and discover the vibrant coral marine life just below the turquoise water's surface. Bartenders aboard also serve delicious fresh cocktails, mocktails and local favorites of Fiji Gold, Fiji Bitter and Fiji Fun throughout the day. Cloud 9 is a little slice of heaven. The floating platform is located in the middle of the ocean and is surrounded by nothing but amazing coral reefs, crystal blue water and the boundless horizon. Picture this; you're relaxing on one of their reclining day beds or cool hanging chairs soaking up the sunshine, sipping on your favourite cocktail, listening to chilled beats playing in the background, gazing out into that beautiful turquoise ocean that seems to go on forever. Sounds too good to be true, but it’s not. This place is unbelievable and so much FUN! So, what are you waiting for this is a MUST if you're visiting Fiji. Book your day trip to Cloud 9 Now! Those seeking more adventure will be happy to know that Cloud 9 also offers a vareity of different water sports and activities to enjoy including flyboarding, motorized surfboards, jet skis and even parasailing. 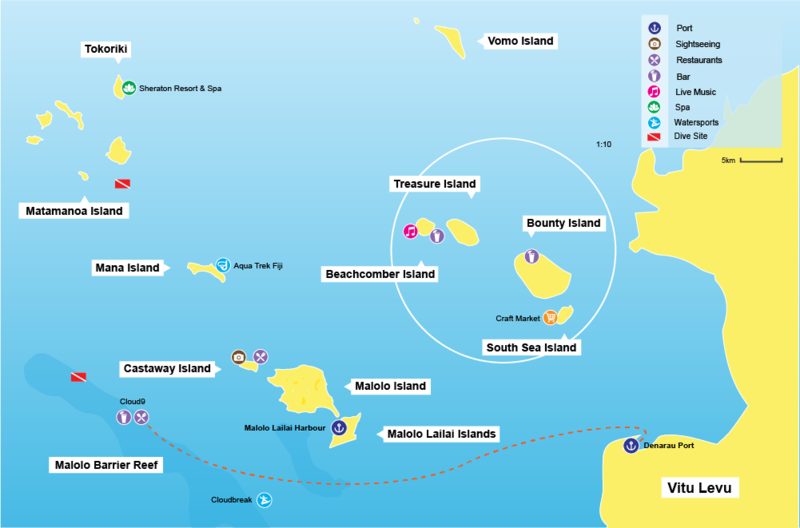 It’s only 40-45 min ride from Denarau Marina which is the main hub for all the island transfers. The boat to Cloud 9 sails close to the western coast of Vitu Levu, offering gorgeous vistas during the journey. Cloud 9 departures from Denarau Marina at 9.15 am, arriving at Cloud 9 at 10.00am daily. Depending on numbers, they also offer a second afternoon trip at 1.15pm for those who prefer a later start. If you fancy a splurge, you can even upgrade to an exclusive seaplane transfer to take you to Cloud 9 in style! The return to Denarau port is by boat transfer at 2pm and 6pm respectively. The floating platform can carry up to 26 guests. The day trip package includes the direct return with transfers and FJ$60 voucher on any food/beverage. All boat transfers are subject to weather conditions and children under 7 years old are NOT permitted. Bring your own towels and don't forget sunscreen! Cloud 9 accepts and prefers international and local credit cards, cash is not accepted. You can book a trip to Cloud 9 with us here. Cloud 9 supports the continuing effort to uphold the highest environmental standards and is proud to be a part of the Mamanuca Environment Society (MES). Their goal is to protect marine life and Fiji’s incredible environment, the place call home by making sure no waste is disposed into the ocean. At the end of each day, waste is transported to the main island to be disposed of following the best waste disposal procedures.